This has now become my new favorite shaving cream. I love how smooth it leaves my skin feeling especially since I have sensitive skin. The best way to use the Ultra moisturizing shave cream is in the shower. All I needed was a few pumps. I then applied the cream on my legs and shaved. I have very sensitive skin, so this shave cream felt very good on my skin. I went with the vanilla scented one because I love the subtle smell of vanilla. Shaving was very easy and smooth with this shaving cream. I did not mind that it did not foam up because I find that the shave cream gives me a smoother shave. The texture is very thick and creamy. Once you rub it onto your legs or body part, it feels very smooth. The top of the bottle is a pump. This shave cream reminded me of a moisturizer and conditioner, so it made shaving very smooth and I didn't even nick myself. I love the smell of the vanilla scented shave cream. The aroma was not super strong but I'm okay with that. I love the subtle smell of the vanilla. I love that it was not very strong scented because I easily get headaches. I highly recommend the vanilla scented version if you are a fan of the vanilla scent. 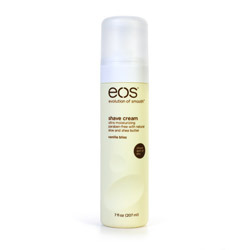 What I loved best about this product was that it is one of the best shaving cream I have purchased. I love how smooth it left my legs feeling. The scent was amazing. I love that this shaving cream was very moisturizing, and once I got out of the shower my legs felt as if I had applied lotion to my legs. The packaging of the vanilla scented Ultra moisturizing shave cream came in a pale yellow plastic bottle with brown lettering and a white top. The bottle also has dents for grip. As soon as I tried the shaving cream, I told my boyfriend my experience and he ran to the bathroom to try it on his face. He later came out very happy saying it left his face extra smooth and prefers my shaving cream over his gel shaving cream. I'm going to have to order another bottle soon. Ultra moisturizing shave cream has become my number one shaving cream. I will have to order another bottle because my boyfriend keeps using my shaving cream for his face shaving. Who returns the "favor" less, men or women? Unscented shave gel in stores? Thank you for viewing Ultra moisturizing shave cream – shaving foam review page!